Even though summer isn’t quite over here in northeastern Ohio, the recent string of cooler days has me thinking ahead to the even cooler days to come. Fall is about crisp days, beautiful scenery, favorite sweaters, football games – and comfort food. I don’t know about you, but after this summer’s record stretch of 90+ degree days I am really looking forward to making soups, stews and different types of chili again. 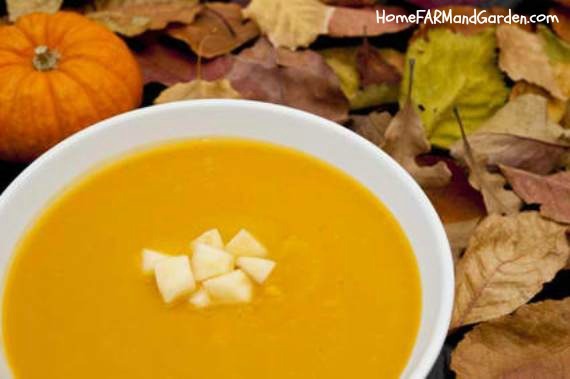 Here is a tasty fall soup recipe that combines butternut squash and farm-fresh apples. You can swap out the butternut squash for acorn squash or pumpkin, if you prefer. Let me know what you think ~ please leave a comment below! Wash the whole squash, then cut in half. Chop the flesh into small, equal-sized chunks, (remove seeds or string). Add the squash to a large pot of lightly salted, boiling water and cook until tender (10 – 15 minutes). Meanwhile, peel the apples, core, and chop. Reserve approximately 1/3 cup apples and place the rest in a a small saucepan with 1/4 cup water. Cook over low heat until soft, making sure they don’t stick to the bottom of the pan. Remove the squash from the boiling water and cool slightly. Reserve the cooking water in the pot. Remove the edible portions from the outer rind and place in a blender or food processor. Blend until smooth; then add smashed apples and process until both are pureed and smooth. Put the squash-applesauce puree into a soup pot and add enough of the reserved cooking water to make a thick soup. You can always add a bit more as you cook the soup to thin it out more. Add the butter and seasonings to the soup and simmer on low heat for about 5 to 10 minutes to let flavors meld. Place a lid on the pot while simmering, but vent it slightly to let steam escape. Add more of the cooking liquid from the squash. if desired. Serve warm, garnish with the reserved fresh diced apples.